Two sites are connected with other. Each site maintains a dialer interface and maps to other site’s telephone numbers. Mulitple link can also be bundled to provide additional bandwidth using multi-link PPP (MLPPP). Figure-1 depicts P2P topology. Recommended for small DDR networks. Allows any-to-any connectivity. However, the trade-off is configuration complexity since each site must maintain mapping for other sites. Additional bandwidth can also be made available if more links are provisioned between sites using MLPPP. Figure-3 depicts the hub and spoke topology. It is the easier to configure as compared to full mesh. Spoke dials to hub (in this case R1) and hub dials-out to relevant spoke site. All the configuration complexities can easily be managed, since only hub maintains the relevant mapping information to spokes. Additional bandwidth can be provided by allocated multiple links between hub and spokes MLPPP. Redundancy can be achieved by providing multiple hubs. Scalability can be achieved with Multi-Chassis MLPPP. If any-to-any connection behavior is required, split horizon (for distance vector protocols) must be disabled on hub router. Dialer profiles separate logical configuration from the physical interface. Because of this separation, multiple dialer profile configuration can share the interface such as ISDN, asynchronous modems or synchronous serial connections. Dialer Profiles bind the logical and physical configuration together dynamically on-call basis. DP can define encapsulation, ACLs, minimum and maximum call etc… for the actual physical interface. Typical usage is bound one physical B channel to another dialer profile and while other B channel bound to anther DP. This allows the same physical interface to used simultaneously for different calls. There is another method called the dialer maps. It is legacy configuration method for DDR and is not discussed in this document. Figure-1 depicts the relation ship between dialer profile components. Logical entities that use a per-destination dialer profile. You can create any number of dialer interfaces in a router. All configuration settings specific to the destination go in the dialer interface configuration. 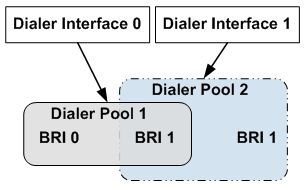 Each dialer interface uses a dialer pool, which is a pool of physical interfaces (ISDN BRI and PRI, asynchronous-modem, and synchronous serial). Each interface references a dialer pool, which is a group of physical interfaces associated with a dialer profile. A physical interface can belong to multiple dialer pools. Contention for a specific physical interface is resolved by configuring the optionalprioritycommand. Interfaces in a dialer pool are configured for encapsulation parameters. The interfaces are also configured to identify the dialer pools to which the interface belongs. Dialer profiles support PPP and High-Level Data Link Control (HDLC) encapsulation. Supply configuration parameters to dialer interfaces (for example, ISDN speed, dialer timers’ parameters, and so on). A map-class can be referenced from multiple dialer interfaces. Out of scope of this tutorial. Example: Consider Figure-2 for details. R1 and R2 are connected with a leased line (T1 connection). 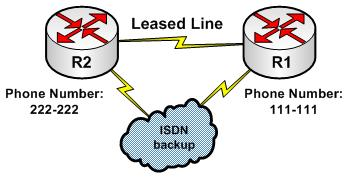 To provide redundancy, ISDN links are provisioned between these two site. All IP traffic is allowed and ISDN will only be used if the T1 connection is not available. R2 has a network 172.16.2.0/24 attached to its LAN segment and R1 has 172.16.1.0/24 attached to its LAN segment. R2 is the spoke site and R1 is the head office. Static routing is used with primary route via leased line and back route through ISDN BRI. hostname R2!username R1 password CISCO-R1!dialer-list 1 protocol ip permit ß allIP traffic is permitted ! ip address 192.168.1.2 255.255.255.252encapsulation pppppp authentication chapdialer pool 10 ß member of dialer pool 10dialer-group 1 ß interesting traffic dialer remote-name R1dialer idle-timeout 900ßidle timeoutif no interesting traffic for 900 seconds dialer string 111111 !ip route 0.0.0.0 0.0.0.0 serial 0 ip route 0.0.0.0 0.0.0.0 dialer 1 250 hostname R1!username R2 password CISCO-R2!dialer-list 1 protocol ip permit ß allIP traffic is permitted ! The existing network could not be modified to accommodate access by the remote sites. The central site must be able to connect to any remote site at any time, and any remote site must be able to connect to the central site at any time. When choosing between alternative technologies, choose the most cost-effective technology. The design must be flexible enough to accommodate additional remote sites in the future. An analysis of the anticipated traffic indicated that each remote site would call the central site an average of four times an hour throughout the business day. This type of traffic pattern means that cost savings can be realized at the central site by providing one telephone line for every 2.5 remote sites (for a total of 48 telephone lines). To spread the calls evenly among the 48 lines, the remote sites connect through a hunt group. The hunt group provides an additional benefit in that all of the remote routers dial the same telephone number to access the central site, which makes the configurations of the remote site routers easier to maintain. In order to complete a transaction initiated by a remote-site, the central site sometimes needs to call that remote site shortly after it has disconnected from the central site. To make this possible, the access network must converge rapidly. The central site also calls the remote sites periodically to update the transaction processing software on the remote workstations. Availability-PSTN is available at all of the remote sites. Potential alternatives, such as Frame Relay and Integrated Digital Services Network (ISDN), were not available at some of the remote sites. Bandwidth-The transaction processing software causes a small amount of data to be transferred between the remote sites and the central site. For this type of low-bandwidth application, the bandwidth provided by asynchronous dial-up is acceptable. Occasionally, the central site dials the remote sites in order to maintain the transaction processing software on the remote clients. This activity will occur at night (in the absence of transaction processing activity), so the bandwidth provided by asynchronous dial-up is adequate. Cost-Given the low-bandwidth requirement, the cost of installing and operating Frame Relay or ISDN equipment could not be justified. Note: Although the network described in this case study uses asynchronous dial-up technology over the PSTN, most of the concepts, such as routing strategy and addressing, also apply when scaling other circuit-switched technologies (such as ISDN). The remote workstations run transaction processing software that uses the Transmission Control Protocol /Internet Protocol (TCP/IP) to connect to a database located at the central site. The remote workstations have no need to run any other network-layer protocol. Given this requirement, the most cost-effective choice of router for the remote site is a router that provides an Ethernet interface and an asynchronous interface, and that supports the Routing Information Protocol (RIP). A Cisco AS5100 is installed at the central site to provide 48 asynchronous interfaces. The Cisco AS5100 consists of three access server cards based on the Cisco 2511 access server, making the Cisco AS5100 equivalent to three Cisco 2511 access servers. Each access server card provides 16 asynchronous lines. Each asynchronous line is equipped with a built-in U.S. Robotics Courier modem. Note: For the purposes of this case study, the three Cisco AS5100 access server cards are referred to as the central-site access routers. Each remote site is equipped with a Cisco 1020 router. The Cisco 1020 provides a single asynchronous interface and an Ethernet interface for connecting to the remote site LAN. The Cisco 1020 runs a limited set of protocols, including TCP/IP and RIP. U.S. Robotics Sportster modems provide connectivity at the remote sites. Using the same brand of modem throughout the access network simplifies chat scripts and modem definition, and makes the network more manageable. A Cisco 4500 controls routing between the new access portion of the network and the backbone. In particular, the Cisco 4500 ensures that when hosts on the other side of the backbone need to connect to a remote site, the connection is made through the optimum central-site access router. Figure: Remote access topology shows the topology of the access portion of the network. Point-to-Point Protocol (PPP) authentication-Either the Password Authentication Protocol (PAP) or the Challenge Handshake Authentication Protocol (CHAP) can be used. Login authentication-With login authentication, the router prompts for a host name and password when a remote router dials in. The remote router logs in and starts PPP. In either case, the database of usernames and passwords can be stored locally or on an extended Terminal Access Controller Access System (TACACS+) server. TACACS+ provides centralized password management for all the central-site access routers and detailed accounting information about connections to and from the remote sites. For the purposes of this network design, login authentication is used because it allows the remote sites to announce their IP addresses to the central-site access routers, as described in the section "Network Layer Addressing" later in this article. Alternatively, PPP could be started automatically if TACACS+ were used to support per-user IP address assignment. In this network, these issues are not a problem. A mask of 255.255.255.0 can be used everywhere, so there are no VLSM concerns. All subnets are from the same major Class B network, so there are no discontiguous subnet concerns. Table: Addressing Summary summarizes the addressing for the access portion of the network. To facilitate an accurate routing table and successful IP Control Protocol (IPCP) address negotiation, all next-hop IP addressing must be accurate at all times. To accomplish this, the remote sites need to know the IP address that they will dial in to, and the central site needs to know the IP address of the remote site that has dialed in. All central-site access routers use the same IP address on all of their asynchronous interfaces. This is accomplished by configuring the Dialer20 interface for IP unnumbered off of a loopback interface. The IP address of the loopback interface is the same on all of the central-site access routers. This way, the remote routers can be configured with the IP address of the router to which it connects, regardless of which router the remote router dials in to. The remote router needs to announce its IP address to the central-site router when the remote router connects. This is accomplished by having the remote router start PPP on the central site using the EXEC command ppp 172.16.x.1. To support this, each central-site access router is configured with the async dynamic address interface configuration command. Note: The autoselect feature allows the router to start an appropriate process, such as PPP, automatically when it receives a starting character from the router that has logged in. To use autoselect, a mechanism for supporting dynamic IP address assignment would be required, such as per-user address support in TACACS+. When a particular remote site is not dialed in to the central site, that remote site must be reachable through any central-site access router by means of a static route configured in each central-site access router. When a particular remote site router is logged in to a central-site access router, that remote site must be reachable through that central-site access router by means of the dynamic route that has been established for that connection and propagated to the backbone. To meet these requirements, the central-site access routes advertise the major network route of the remote sites to the Cisco 4500. All routes to the remote sites are equal-cost through all of the central-site access routers. Each central-site access router is configured to have a static route to each remote site. To allow the Cisco 4500 to use all of the central-site access routers for connecting to the remote sites, the no ip route-cache interface configuration command is configured on Ethernet interface 0 of the Cisco 4500, disabling fast switching of IP to the subnet shared with the central-site access routers. This causes the Cisco 4500 to alternate between the three access routers when initiating outbound calls. This strategy increases network reliability for those cases when one of the access routers goes down. When a remote router logs in, it announces its IP address and sends a RIP flash. The RIP flash causes a dynamic route to the remote site to be installed immediately in the routing table of the central-site access router. The dynamic route overrides the static route for the duration of the connection. Next, the central-site access router redistributes the RIP route into Open Shortest Path First (OSPF) and sends the route to all of its OSPF neighbors, including the Cisco 4500, which installs it in its routing table. The Cisco 4500 now has a major network route to all of the remote sites, plus a dynamic route to the specific remote site that has logged in. If a central-site host needs to communicate with a particular remote site that is currently logged in, it does so through the dynamic route. When the remote site logs out, the dynamic route must be removed from the Cisco 4500, and the static route to the remote site must be restored on the central-site access router into which the remote router logged in. If a central-site host requires communication with a remote site that is not logged in, it will use the major network route defined in the Cisco 4500. A central-site access router, selected in round-robin fashion, is used to initiate the call to the remote site via the static route that is defined for it in the configuration for the selected access router. As in the case of a remote site that calls the central site, once the connection is made, the remote-site router sends a RIP flash that causes a dynamic route to the remote site to be installed immediately in the routing table of the central-site access router. This dynamic route is redistributed into OSPF and is installed in the routing table of the Cisco 4500. Figure: Routing strategy state diagram uses a state diagram to summarize the routing strategy. During the time between State 2 and State 3, a host at the central site might initiate a call to the remote site. Until State 3, at which time the routes converge on the Cisco 4500, any central-site access router that dials the remote site will fail with a busy signal. In practice, only one call fails: by the time a second connection attempt is made, the routes will have converged in State 3, the dynamic route will be available for use, and there will be no need to make another call. Note: Fast install of static routes is a new feature in Cisco IOS Software Release 11.1 that quickly converges back to the static route when a remote site disconnects. If, before convergence occurs, the Cisco 4500 directs a call through CENTRAL-1 to Router 2, the call will fail and must be retried. IP fast switching is turned off on the Cisco 4500, so the Cisco 4500 (which is using equal-cost paths to each of the central-site access routers) will send the next packet through CENTRAL-2 or CENTRAL-3 (which still have a static route for Router 2) and the call will go through. Note: When developing the routing strategy for this network, the designers considered the use of snapshot routing, which reduces connection cost by limiting the exchange of routing protocol updates. For snapshot routing to work, each remote site must connect to the same access router every time it dials into the central site. In this design, the remote routers connect to the central-site access routers through a hunt group, so there is no way to control to which central-site access router a remote router will connect for any particular connection. Therefore, snapshot routing cannot be used for this design. For the complete configuration see the section "CENTRAL-1 Configuration" later in this article. The three chat-script global configuration commands establish three scripts named CALL1020, REM, and usrv32bis. CALL1020 and REM are invoked by the dialer map commands to dial and log in to the remote sites, respectively. The script reset command specifies that the USRV32BIS script is to be run whenever an asynchronous line is reset in order to ensure that the central-site modems are always configured correctly. The goal is for all three access routers to appear to have the same IP address during IPCP negotiation with the remote sites. (IPCP is the part of PPP that brings up and configures IP support.) This goal is accomplished by creating a loopback interface, assigning to it the same IP address on each central-site access router, and running the ip unnumbered interface configuration command using the loopback interface address. The problem with this strategy is that OSPF takes its router ID from the IP address of a loopback interface, if one is configured, which would mean that all three access routers would have the same OSPF router ID. The solution is to create loopback interface 0 and assign to it a unique IP address (which results in a unique OSPF router ID for each router). The configuration then creates loopback interface 1 and assigns to it the same IP address on each router. Loopback interface 1 allows the ip unnumbered command to be applied to dialer rotary group 20 later in the configuration. For each of the 16 asynchronous interfaces provided by the access router, the configuration uses the ip unnumbered interface configuration command to specify that the asynchronous interface is to use the IP address of loopback interface 1 as the source address for any IP packets that the asynchronous interface generates. The IP address of loopback interface 1 is also used to determine which routing processes are sending updates over the asynchronous interface. The async dynamic address interface configuration command enables dynamic addressing on the asynchronous interface. This command is required to allow each remote router to specify its IP address when it logs in. The async dynamic routing interface configuration command allows the interface to run a routing protocol, in this case RIP. The async mode interactive interface configuration command allows a remote router to dial in and access the EXEC command interface, which allows the remote router to start PPP and specify its IP address. The dialer in-band interface configuration command allows chat scripts to be used on the asynchronous interface. The chat scripts allow the access router to dial the remote sites. The dialer rotary-group interface configuration command assigns each asynchronous interface to dialer rotary group 20. The interface dialer global configuration command defines dialer rotary group 20. Any interface configuration commands that are applied to a dialer rotary group apply to the physical interfaces that are its members. When the router's configuration includes multiple destinations, any of the interfaces in the dialer rotary group can be used to place outgoing calls. The ip unnumbered interface configuration command specifies that the IP address of loopback interface 1 is to be used as the source address for any IP packets that dialer rotary group 20 might generate. The dialer idle-timeout interface configuration command causes a disconnect if 60 seconds elapses without any interesting traffic. The configuration includes a dialer map interface configuration command for each remote router that the central-site access router might dial. The ip keyword specifies that the dialer map is to be used for IP packets, the IP address is the next-hop address of the destination that is to be called, and the name keyword specifies the host name of the remote router that is to be called. The modem-script keyword specifies that the CALL1020 chat script is to be used, and the system-script keyword specifies that the REM chat script is to be used. The last value specified by the dialer map command is the telephone number for the remote router. The dialer map commands do not specify the broadcast keyword, so RIP updates are not sent to the remote sites. For the Dialer20 interface, the dialer-group interface configuration command defines interesting packets to be those packets defined by the corresponding dial-list command. Interesting packets cause a call to be made or cause a call to be maintained. In this case, access list 101 defines RIP as uninteresting. (RIP uses User Datagram Protocol [UDP] port 520.) All other packets are defined as interesting. Each central-site access router uses the following commands to configure OSPF. These commands limit the routes that are redistributed into OSPF to the major Class B static route and any dynamic subnet routes that may exist for currently connected remote sites. Limiting the routes that are redistributed into OSPF simplifies the routing table on the Cisco 4500 significantly. The router ospf global configuration command enables an OSPF routing process and assigns to it a process ID of 110. The first redistribute router configuration command causes static IP routes to be redistributed into OSPF. The subnets keyword specifies that subnets are to be redistributed, and the route-map keyword specifies that only those routes that successfully pass through the route map named static-to-ospf are to be redistributed. The static-to-ospf route map permits the redistribution of routes that match access list 21. Access list 21 permits only major network 172.16.0.0. The second redistribute router configuration command causes RIP routes to be redistributed into OSPF. The subnets keyword specifies that subnets are to be redistributed, and the route-map keyword specifies that only those routes that successfully pass through the route map named rip-to-ospf are to be redistributed. The rip-to-ospf route map permits the redistribution of routes that match access list 20. Access list 20 permits only routes that start with 172.16 and end with .0 (the third octet is wild). In effect, the RIP-TO-OSPF route map allows only subnets that match 172.16.x.0. For each asynchronous interface, there is a passive-interface router configuration command, which means that OSPF routing information is neither sent nor received through the asynchronous interfaces. The distance router configuration command assigns the OSPF routing process an administrative distance of 210. This allows the central-site access routers to prefer their static routes (with an administrative distance of 200) over routes learned by OSPF. Note: When a remote site logs in and a dynamic route is established for it, the other access routers retain their static routes for that remote site. When a remote site logs out, the other access routers do not need to update their routing tables-their routing tables still contain the static routes that are necessary for dialing out to the remote site. The timers basic router configuration adjusts the RIP update, invalid, holddown, and flush timers. The command specifies that RIP updates are to be sent every 30 seconds, that a route is to be declared invalid if an update for the route is not received within 35 seconds after the previous update, that the time during which better routes are to be suppressed is 0 seconds, and that one second must pass before an invalid route is removed from the routing table. These timer adjustments produce the fastest possible convergence when a remote site logs out. The network router configuration command specifies that network 172.16.0.0 is to participate in the RIP routing process. There is no need to propagate RIP routes to the Cisco 1020s, so the distribute-list out router configuration command specifies that access list 10 is to be used to control the advertisement of networks in updates. Access list 10 prevents RIP routes from being sent to the remote site. One static route points to the next hop on the dialer map. Note that the "200" makes this route a floating static route, but that it is lower than OSPF routes (which are set to 210 by the distance command, earlier in the configuration). This means that a RIP route triggered by a connection to a remote site (whether the connection is initiated by the remote site or the central site) will override the static route. An OSPF update initiated by a remote site that dials in will not override a static route that points to the next hop address on the dialer map. One static route that defines the interface at which the next hop can be found (in this case, dialer interface 20). This static route is required for unnumbered interfaces. Note there is no need to make this a floating static route. The configuration for each central-site access router includes the login line configuration command for each asynchronous line and specifies the local keyword. This command causes the access router to match the username and password specified by the username global configuration command against the username and password that the remote site specifies when it logs in. This security method is required to allow the remote sites to log in and specify their IP addresses. Compress the configuration file using the service compress-config global configuration command. Have the central-site access routers boot using configuration files stored on a Trivial File Transfer Protocol (TFTP) server. For the complete configuration, see the section "Router2 Configuration" later in this article. chat-script CENTRALDIAL "" "ATDT 5551111" "CONNECT" "" "name:" "Router2" "word:" "outthere" ">" "ppp 172.16.2.1"
The chat-script command defines a chat script named CENTRALDIAL that is used to place calls to the central site. The CENTRALDIAL chat script specifies the telephone number (555-1111) of the central site and the expect-send sequences that guide the modem through the dial-up process. A key feature of the chat script is that when the remote router receives the string > (the prompt indicating that the remote site router has successfully logged in to a central-site access router), the remote router sends the EXEC command ppp 172.16.2.1, which informs the central-site access router of the remote router's IP address. interface async 1 speed 38400 modem-type usr-sport-v32 dialer rotary-group 1 ! modem-def usr-sport-v32 </tt> "USR Sportster v.32bis" 38400 "" "AT&F1" "OK"
The speed line configuration command sets the baud rate to 38400 bits per second for both sending and receiving. The modem-type command specifies the initialization string sent to the modem when the interface is reset or when a clear interface async command is issued. The initialization string is defined by the modem-def command for usr-sport-v32. The dialer rotary-group interface configuration command assigns asynchronous interface 1 to dialer rotary group 1. The site global configuration command defines a remote location that the router can dial in to or that can dial in to this router, or both, and names it CENTRAL. The name is used to authenticate the central site when it dials in. The dial-onsite configuration command uses the demand keyword to specify that the central site is to be dialed and a connection established only when packets are queued for the central site. The encapsulation site configuration command specifies that when the router establishes a connection with the central site, it is to use PPP encapsulation. The ip address interface configuration command associates IP address 172.16.1.1 with the CENTRAL site. Note that IP address 172.16.1.1 is the address of the dialer 20 interface on each of the central-site access routers. The routing rip interface configuration command and the broadcast keyword specify that when the router is connected to the central site, IP routing updates are to be broadcast, but any incoming IP routing updates are to be ignored. The dialgroup command specifies that dial group 1 is to be used when connecting to the central site. Earlier in the configuration, the dialer rotary-group command assigned asynchronous interface 1 to group 1. The session-timeout site configuration command specifies that if a period of five minutes elapses during which there is no input or output traffic, the router is to close the connection. The system- script site configuration command specifies that the CENTRALDIAL chat script is to be used to dial the central site. The password site configuration command specifies that when a central-site access router logs in, its password must be the string "secret." The ip route commands establish static IP routes for networks located at the central site, all reachable through a next-hop address of 172.16.1.1, which is the IP address shared by all of the access routers at the central site. All ip route commands specify an administrative distance of 1, which is the default. 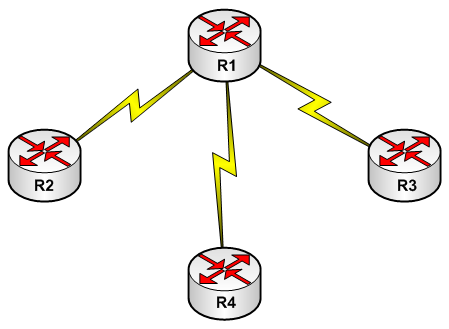 This section contains the complete configurations for CENTRAL-1 and Router2. The complete configuration for CENTRAL-1 follows. Those portions of the configuration that must be unique to each central-site access router are highlighted in bold. The complete configuration for Router2 follows. Those portions of the configuration that must be unique to each remote site router are highlighted in bold. This case study shows that it is possible to scale dial-on-demand routing to accommodate large dial-up networks. If, in the future, the number of remote sites exceeds the capacity of the 48 asynchronous interfaces, additional routers can be installed without modifying the routing strategy. Although this case study focuses on asynchronous media, many of the techniques can be applied to other dial-up technologies, such as ISDN.